Scuba Diver Australasia Indonesia magazine selected Gorontalo as its featured destination in its final 2014 edition. 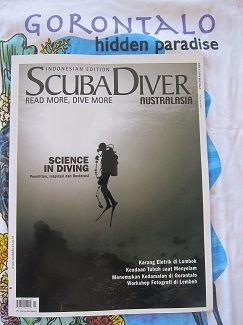 This premier dive magazine is published five times a year. Scuba Diver Australasia Indonesia is written in Bahasa Indonesia. It works in partnership with the English language edition. Ibu Jilm Astina and Bapak Arief Yudo Wibowo direct the Indonesian edition. This husband and wife team seek to publish a fresh magazine for the modern diver. They have also been diving in Gorontalo. Scuba Diver Australasia Indonesia has devoted six pages to Gorontalo. The article was written by Rantje Allen of Miguel’s Diving. The article explains the mystery and uniqueness of Gorontalo diving. It also describes the effect of diving in Gorontalo on the modern diver. Leaving the busy world behind, divers find beauty and tranquility. Divers departing Gorontalo take beautiful pictures home along with a refreshed spirit. Anticipation for a return trip is part of the Gorontalo diving experience. Photographs for the article were taken by Ibu Sofi Sugiharto. Scuba Diver Australasia Indonesia magazine has published her photographic works from other destinations. She dived with Miguel’s Diving Gorontalo in November 2013. 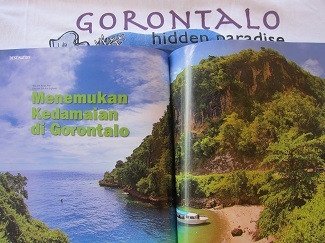 The opening double page photo is a colorful shot of a small cove in Gorontalo. Locals call this location “Olahutakiki.” Also selected for the article in Scuba Diver Australasia Indonesia is a split shot taken at Hidden Beach. Gorontalo provides fantastic opportunity for wide angle photography. Included in the Scuba Diver Australasia Indonesia article is a photo of one of Gorontalo’s famous Salvador Dali sponges. Three of Ibu Sofi’s macro photographs from Gorontalo were selected for the Scuba Diver Australasia Indonesia article. One is a baby batfish hovering in a sunburst. Two others are a Saron shrimp and a Boxer crab. Scuba Diver Australasia Indonesia magazine also features “Photo of the Month.” The winner for Wide Angle went to Reyner Onggara. It shows an albino Salvador Dali sponge with a cavern opening as backdrop. It was taken during Reyner’s most recent trip to Gorontalo. Scuba Diver Australasia Indonesia’s Dive Junkie section chats with Marischka Prudence. She gives a “thumbs-up” to diving in Gorontalo. For your chance to find tranquility in Gorontalo, please book your dive trip with us.